Tuesday 30th December saw a fundraiser for HACE at 1648 Bar and Grille at French Leave Eleuthera. 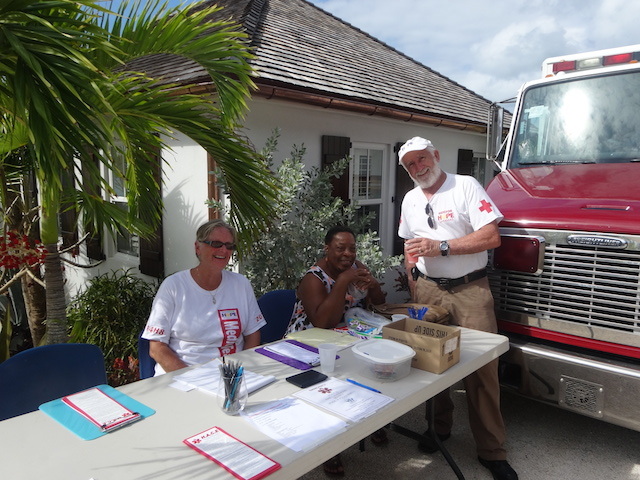 Organised by the indomitable Ann Cutbill Lenane – a real champion for the Health Association of Eleuthera – or HACE as it is known – it was held to raise funds for a new ambulance for Hatchet Bay. Although they do have an ambulance – it is 27 years old and leaks in both the cab and patient area. The powerhouse that is the lovely Ann Cutbill Lenane – second from the left wearing white. At the moment emergencies are dealt with by the ambulance from Palmetto Point but of course response time and high fuel costs are two problems that need to be solved. 1648 Bar and Grille provided a delicious lunch from the kitchen of Chef Peter Hamm with pizza, macaroni cheese and a fabulous spinach and cheese baked dip served with chips. Wine and rum punch were also provided by front of house manager Byron Lowe and his team on a beautiful warm sunny day around the pool and deck area. Cooling off in the pool….. The first ambulance for central Eleuthera was purchased around 1984 by the Kiwanis Club and in 1987 Dr Cliff Bacchus started HACE as a bridge between the community and the medical centre. HACE is an entirely voluntarily run organization that provides a 24 hour emergency ambulance service from Savannah Sound up to Gregory Town. They handle between 60 and 70 calls a year including call out to homes where someone is ill as well as to the scene of road accidents. Current ambulance drivers are Neville Sands, Jason Thompson, Bryan Johnson and of course Chris Gosling – Chairman of HACE since the late 90’s. He started as an ambulance driver and maintenance man in 1990 and has been active with HACE ever since along with his lovely wife Alison Gosling who has the grisly task – amongst many others – of cleaning up the ambulance after it has been used. They are on call 24 hours every day – amazing dedication that thoroughly deserves our support. HACE is holding a silent auction on February 15th 2015 to raise more funds for general expenditure which currently runs at about $40,000 per year. The venue has yet to be announced but rest assured I will be making an announcement closer to the time. Donations are needed for the silent auction as well of course monetary donations which can be made all year round. If you have items suitable for the auction please call Chris and Alison Gosling on any of the following numbers – 242 332 3178 or – 242 557 7006 – or – 242 553 6227 – they can be dropped off to them by arrangement. Plenty of supporters for the fundraiser.